The Gallery represents mid-career and senior Canadian contemporary painters and sculptors. We also host occasional exhibitions by international artists. Our art consultants work with clients and designers; our shipping department takes care of professional packing and delivery to clients all over the world. 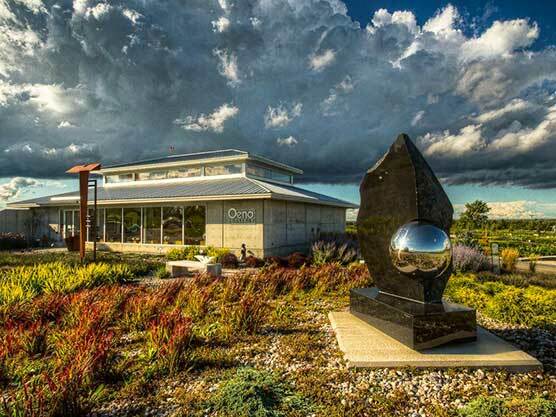 More than 25,000 people attend our monthly indoor exhibitions, or visit Oeno’s Sculpture Garden at Huff Estates, which spreads over 4 landscaped acres, next to the vineyard, and features more than 30 sculpture installations. The Gallery is next to Huff Estates Winery and Inn. The Winery features outstanding patio dining throughout the summer season.